What precautions should be taken after the procedure? Usually, a three to four-day rest at home is advised. It is possible to resume its visual activities from the next day (television, reading). It is necessary to avoid rubbing the eyes with the fingers. It is advisable to have very clean hands and cut nails. The usual heavy, violent and excessive efforts are prohibited. Usually, the recovery of a normal life is possible after a week. After the procedure, treatment is prescribed for several weeks, certain eye drops may sting or irritate the eyes but usually in a tolerable manner. Each vial must be renewed every fortnight, the same prescription permits. The drops must be instilled within a few minutes of interval regardless of the order. Wearing transparent protective goggles for one week after the procedure. In general, the prescription of corrective glasses is done after several days see a month if they prove necessary. Some side effects can be observed after a cataract intervention even if they are sometimes a little inconvenient, they are in fact the consequence of an operation that remains in all cases successfully. Transient and definitive side effects are distinguished. A vision disorder is classic The first few days, the vision gradually brightens. Sometimes the eye can be a little red the days following the procedure, this is directly related to the surgical act itself. The redness of the eye disappears after a few days. A sensation of friction, foreign body, and are very common in immediate operating suites and are related to the drought lacrimal often attributable moreover to the cleaning of the eye before the operation to the betadine which tends to slightly dry the eye. It is also common to feel a pain of varying intensity during the first 24 hours. It may be due to transient ocular hypertonia or superficial erosion of the cornea. The pain disappears very quickly in the first 24 hours. Visual acuity is generally assessed after a few days when corneal transparency is restored. The importance of the recovery of vision depends not only on the operation but also on the integrity of the retina and the optic nerve. Sometimes you can analyze the retina or optic nerve only after the operation. A retinal anomaly or optic nerve may explain sometimes that the recovery of visual acuity is not completely satisfactory. The myodésopsies is the scientific name for intra vitréens floating bodies, which are called still flies or butterflies, which are usually seen on a clear surface (the sky, the ceiling, a white sheet). These floating bodies, in general, are innocuous but require control of the peripheral retina. 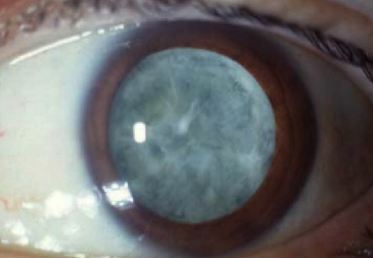 Floating bodies are often more frequent after cataract surgery due to the displacement of the glaze in the eye following the ablation of the lens. If in some cases one can have an excellent vision without glasses after the intervention of the cataract, this is not always possible in all cases, especially if there is a regular or irregular corneal astigmatism that may require a correction by glasses. – A few months or a few years later a decrease in the progressive vision can also occur in the eye operated and is usually related to a gradual clouding of the posterior envelope of the crystalline left in place is called that secondary cataract or clouding of the posterior capsule. This one is responsible for a veil and a drop in vision and is very easily treated in the cabinet by a capsulotomy YAG laser which is a very simple act that immediately improves visual acuity. It’s interesting that your vision can actually be affected for the first few days after a cataract surgery. It makes sense that brightened vision is a common side effect that people notice. This is something to talk to my mom about because I want to ensure she has a good recovery and making sure she has proper eye care and protection after the procedure would help keep my mind at ease.